There are few things I love more that cake, London and bargains (maybe Mr Osbiston, but that’s a different kind of love). So you can imagine that I jumped at the chance to take up a recent Time Out London deal to go on a guided Cupcake & Macaron walking tour around Soho and surrounds by Great British Tours. And it wasn’t particularly difficult to convince Jen to come along. The tour kicks off outside the M&S in Covent Garden and is led by (in our case) a very handsome young Scottish gentleman named John. I am not sure if he is the only guide doing this particular tour and his, er, aesthetic appeal is hardly relevant to his ability to shepherd a group through Covent Garden market (challenging at any time but especially in summer) but I feel I must mention it in case anyone is considering this as a hen party option. Our first stop on this decadent adventure was the Cupcake Bakehouse, which is former model and TV baker, Lorraine Pascal’s bakery. En route John explained the origins of the market and the area and how it influenced the surrounding areas. Who knew it was once all arable land? We were each offered a mini-cupcake to taste, with Jen going for red velvet and me trying out cherry crumble. Both were light, moist and absolutely delicious. 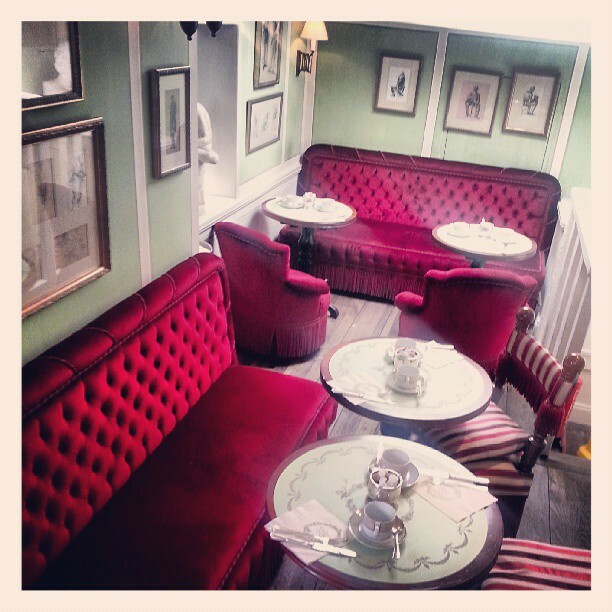 From there we crossed the market, learning about Punch & Judy shows, to sample macarons at Ladurée, a stunning French tea house. Apparently in order to check the freshness of a macaron, you should hold it between thumb and forefinger and press gently on it. If it springs back it’s at optimal freshness. 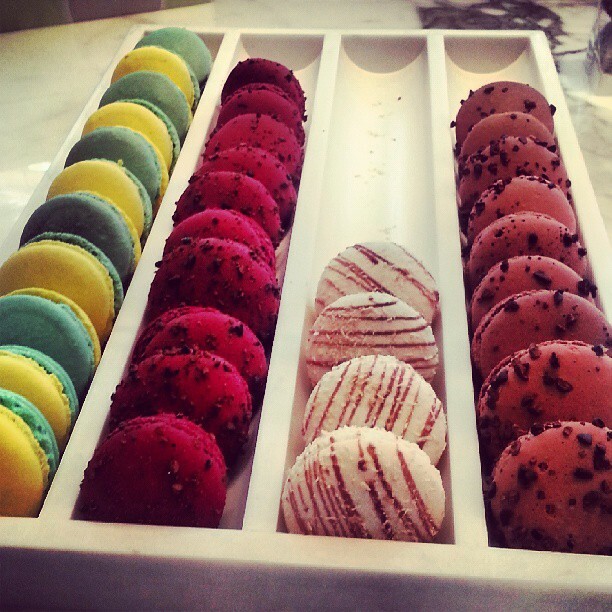 Ladurée takes macarons very seriously and insists on maturing them for 8 days. Their flavours tend to be traditional and mine was a delicate pink rose water. Really, I shouldn’t eat macarons because I am allergic to nuts but I survived the post indulgence migraine and itching so I figure it was all worth it. Our next cupcake stop was Sweet Couture on New Row, a cute compact shop, where we were able to pick out our own full-sized cupcake. I went for Oreo, which not only had Oreo icing and a mini Oreo on top but also crushed Oreos in the actual cake!! Cookie/cupcake heaven! Probably the lightest cupcake of the day. All cupcakes at Sweet Couture are baked on the day for the same day so some flavours are not always available but the freshness really shows. Will definitely be back! Dim Sum and cake are not usually two things you would put together but Yauatcha on Broadwick Street pulls together the concept of a dim sum teahouse with contemporary patisserie. It is an absolute feast for the eyes, never mind the belly and I would love to go back and sample some of the gorgeous things that were on display. This time we were sampling macarons with some more unique flavours available. I went for an intensely yellow popcorn one, which I ate later at home because I was feeling a little bit stuffed after my giant Oreo cupcake. I was surprised by just how much the popcorn flavour came through. By this point everyone was ready for a drink and little sit down, so we were grateful to get both at Patisserie Valerie on Old Compton Street. Contrary to popular belief, Patisserie Valerie is Belgian rather than French and operates cafes all over the UK. This time I went for the ultimate classic macaron – vanilla. Simple and satisfying, although possibly without the wow factor of some of the cuter independent places we visited. 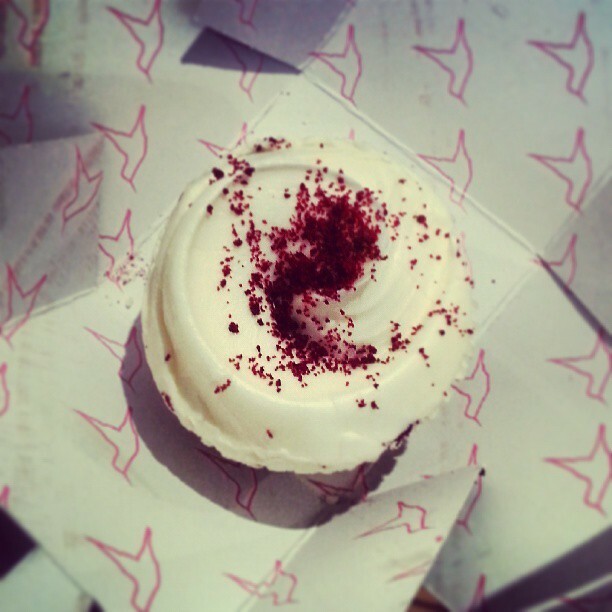 After having Louie Spence’s house pointed out to us, we headed to the most well-known Soho cupcake bakery, Hummingbird. I will admit to being a bit of a fangirl of this American inspired cupcake bakery. I have the original cookbook and I swear by a lot of the recipes in it, including the brownies and the best chocolate icing in the world, ever! I am obviously not the only one and the funky pink shop was packed with people trying out a wide variety of treats. 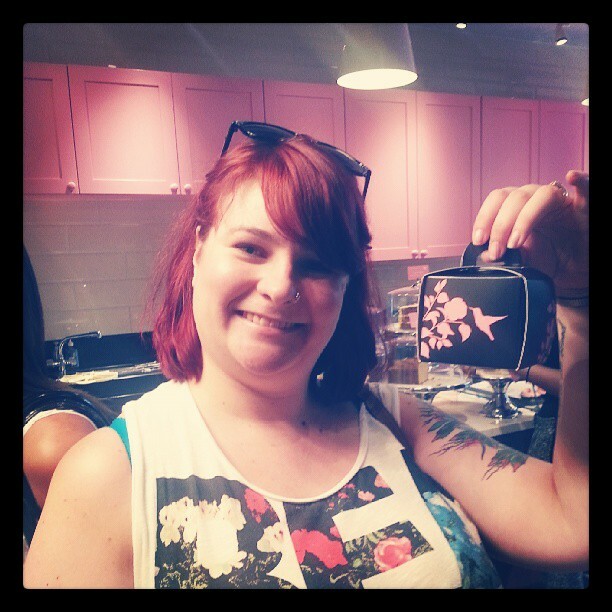 We were each presented with a red velvet cupcake in the iconic hummingbird box. As you can see, I was very impressed. 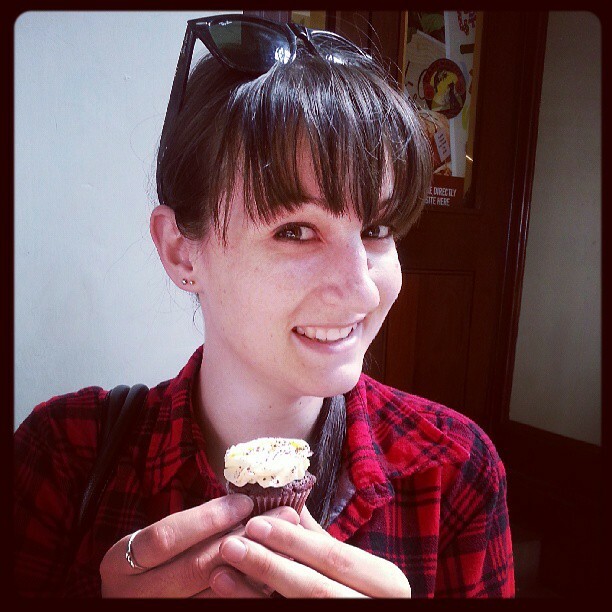 The cupcake itself was an absolute beauty and I hesitated for a whole ten seconds before devouring it at home. The cream cheese icing was absolutely delicious and you can definitely see why everyone wants a nibble. 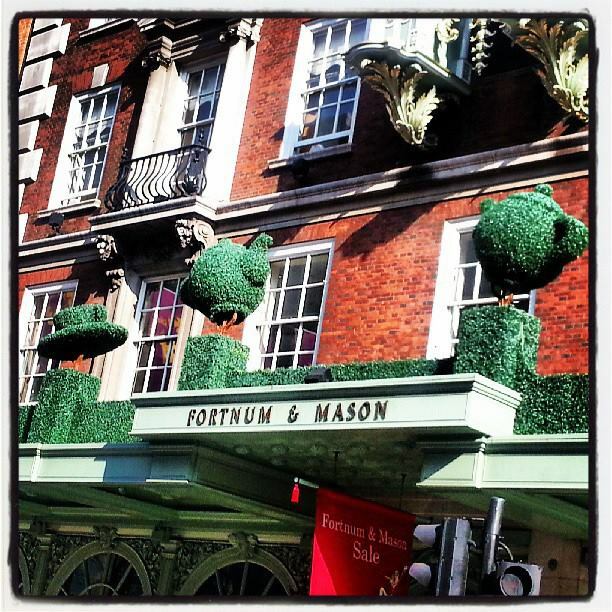 Our very last stop was the iconic Fortnum & Mason, traditional home of fine foods and teas for over 300 years. Right now the store has an amazing topiary on top of it in celebration of the 60th anniversary of the coronation of her maj. It’s so irresistibly British in the way that Americans imagine British things are. We were able to choose our own macarons from a range of traditional and more unusual flavours on display at the impressive cake counter. 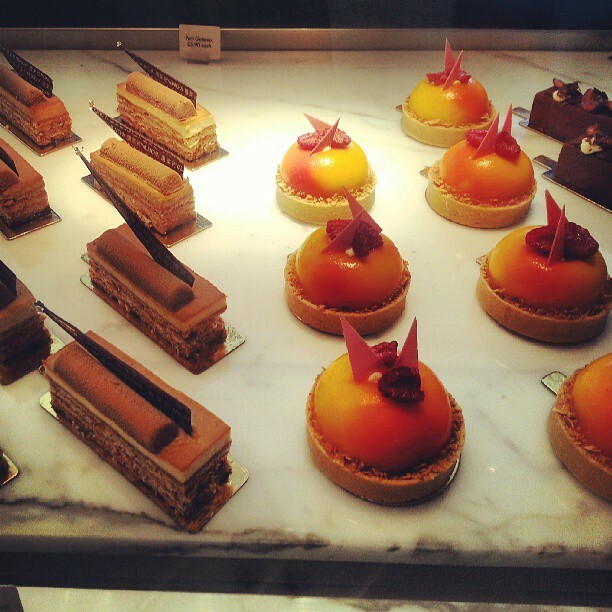 I went for passion fruit and chocolate, which I also saved for home. In hindsight it was a bit of an odd flavour combination and although the macaron was beautifully made, it wasn’t a patch on Yauatcha or Laduree. By the end of the tour we were knackered and full of cake, historical information and a list of places to revisit. If you are a fan of baked goods, this is an excellent way to spend an afternoon and get even the most reluctant of ramblers to go for a wander through Soho. Tours take place from Thursday – Saturday for 2 ½ hours starting at 3pm and must be advanced booked. Tours normally cost £40 but we bought ours on a deal for £19.